Wage stagnation for the vast majority was not created by abstract economic trends. Rather, wages were suppressed by policy choices made on behalf of those with the most income, wealth, and power. In the past few decades, the American economy generated lots of income and wealth that would have allowed substantial living standards gains for every family. The same is true looking forward: Overall income and wealth will continue to grow. The key economic policy question is whether we will adopt policies that enable everyone to participate in a shared prosperity, or whether the growth of income and wealth will continue to accrue excessively and disproportionately to the best-off 1 percent. The first policy choice should be to quickly restore full employment. The Federal Reserve Board can do this by not raising interest rates and slowing the recovery in the name of fighting inflationary pressures until wage growth is much, much stronger. Congress and the president can pursue the return to full employment by making public investments that can create both jobs and future productivity growth. After this, policymakers should support those labor standards that can restore some bargaining power to low- and moderate-wage workers in coming years. That means policy actions such as passing a higher minimum wage, expanding rights to overtime pay, providing paid sick leave, protecting the labor rights of undocumented workers, and restoring the right to collective bargaining. Policymakers should reject trade treaties that provide corporations greater rights and sap our manufacturing job base. 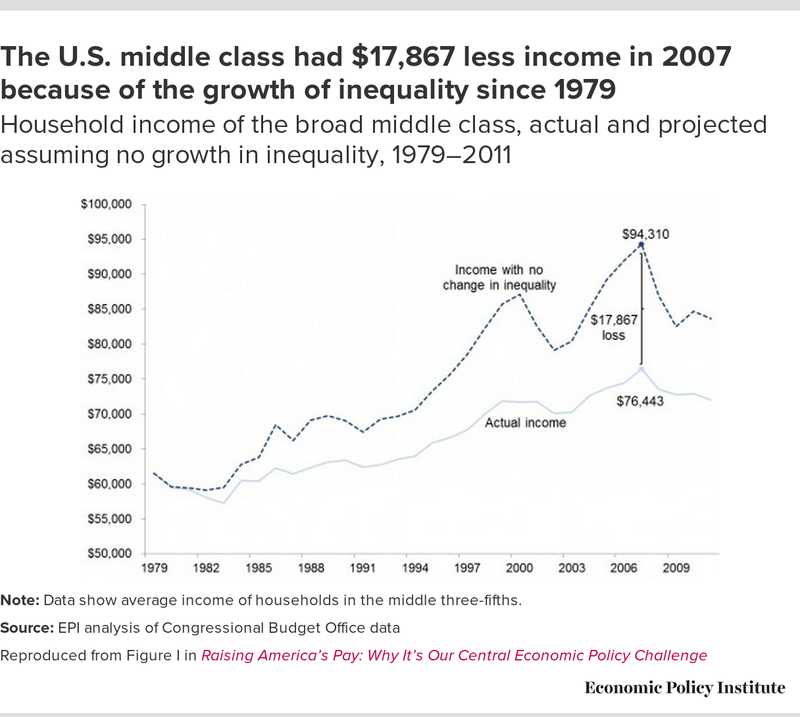 This figure shows that the stakes of rising inequality for the broad American middle class are enormous. The figure compares the income growth of the middle three-fifths of American households since 1979 to their income growth had there been no growth in inequality. In 2007, the last year before the Great Recession, the average income of the middle 60 percent of American households was $76,443. It would have been $94,310, roughly 23 percent (nearly $18,000) higher had inequality not widened (i.e., had their incomes grown at the overall average rate—an overall average buoyed by stratospheric growth at the very top). The temporary dip in top incomes during the Great Recession did little to shrink that inequality tax, which stood at 16 percent (nearly $12,000) in 2011. Note: Data show average income of households in the middle three-fifths. Source: EPI analysis of data from The Distribution of Household Income and Federal Taxes, 2011, the Congressional Budget Office, 2014. 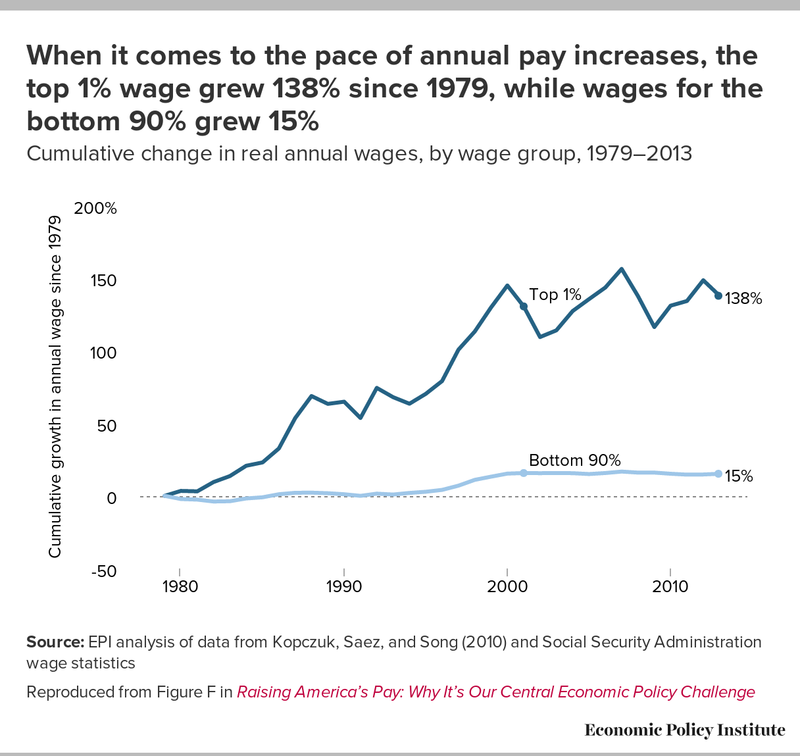 Reproduced from Figure I in Raising America’s Pay: Why It’s Our Central Economic Policy Challenge, by Josh Bivens, Elise Gould, Lawrence Mishel, and Heidi Shierholz, Economic Policy Institute, 2014. Slow and unequal wage growth in recent decades stems from a growing wedge between overall productivity—the improvements in the amount of goods and services produced per hour worked—and the pay (wages and benefits) received by a typical worker. 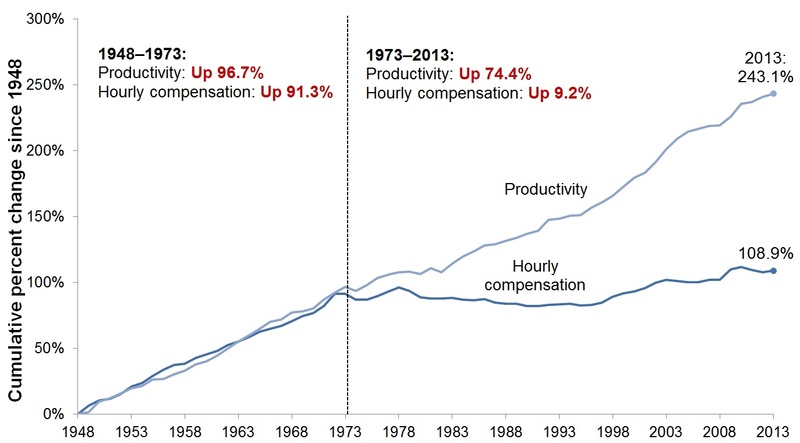 The figure shows that in the three decades following World War II, hourly compensation of the vast majority of workers rose 91 percent, roughly in line with productivity growth of 97 percent. But for most of the past generation (except for a brief period in the late 1990s), pay for the vast majority lagged further and further behind overall productivity. From 1973 to 2013, hourly compensation of a typical (production/nonsupervisory) worker rose just 9 percent while productivity increased 74 percent. 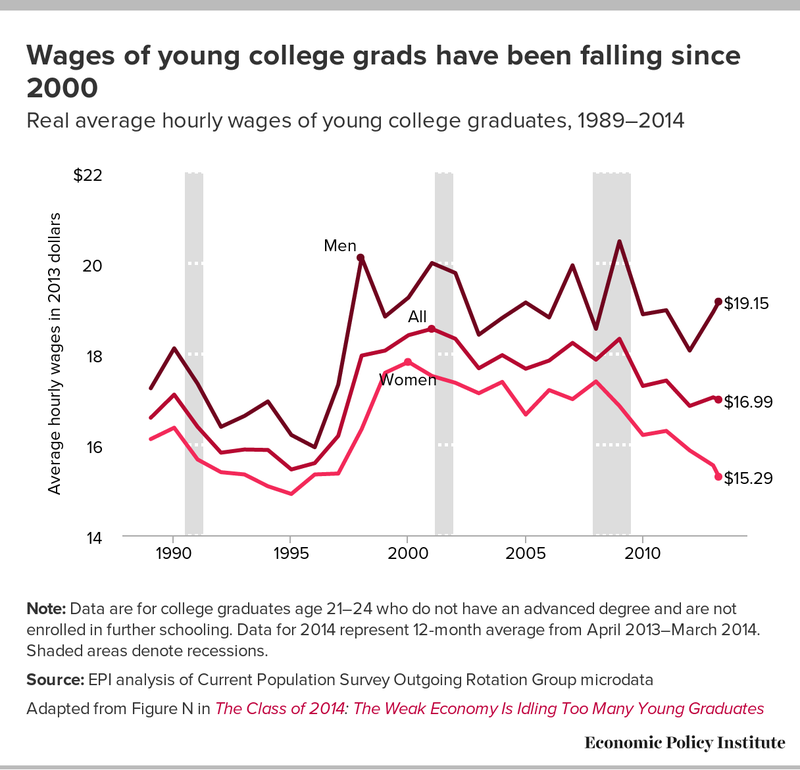 This breakdown of pay growth has been especially evident in the last decade, affecting both college- and non-college-educated workers as well as blue- and white-collar workers. This means that workers have been producing far more than they receive in their paychecks and benefit packages from their employers. The ability of those at the very top to claim an ever-larger share of overall wages is evident in this figure. Two things stand out. First is the extraordinarily rapid growth of annual wages for the top 1 percent compared with everybody else: Top 1 percent wages grew 138 percent, while wages of the bottom 90 percent grew just 15 percent. If the wages of the bottom 90 percent had grown at the average pace over this period—meaning that wages grew equally across-the-board—then the bottom 90 percent’s wages would have grown by 32 percent, more than double the actual growth. Source: EPI analysis of data from “Earnings Inequality and Mobility in the United States: Evidence from Social Security Data Since 1937,” by Wojciech Kopczuk, Emmanuel Saez, and Jae Song, The Quarterly Journal of Economics, February 2010; updated through 2013 with data from the Social Security Administration Wage Statistics database. Reproduced from Figure F in Raising America’s Pay: Why It’s Our Central Economic Policy Challenge, by Josh Bivens, Elise Gould, Lawrence Mishel, and Heidi Shierholz, Economic Policy Institute, 2014. 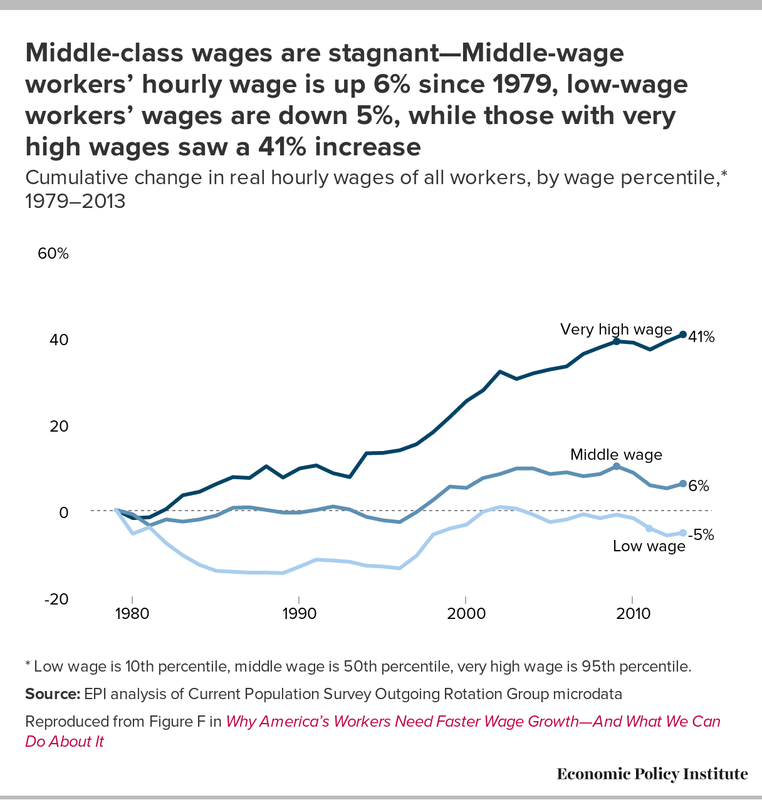 Over the entire 34-year period between 1979 and 2013, the hourly wages of middle-wage workers (median-wage workers who earned more than half the workforce but less than the other half) were stagnant, rising just 6 percent—less than 0.2 percent per year. This wage growth, in fact, occurred only because wages grew in the late 1990s when labor markets got tight enough—unemployment, for instance, fell to 4 percent in 1999 and 2000—to finally deliver across-the-board hourly wage growth. The wages of middle-wage workers were totally flat or in decline over the 1980s, 1990s and 2000s, except for the late 1990s. The wages of low-wage workers fared even worse, falling 5 percent from 1979 to 2013. In contrast, the hourly wages of high-wage workers rose 41 percent. * Low wage is 10th percentile, middle wage is 50th percentile, very high wage is 95th percentile. Source: EPI analysis of Current Population Survey Outgoing Rotation Group microdata from the CPS survey con­ducted by the Bureau of the Census for the Bureau of Labor Statistics [machine-readable microdata file]. Washington, D.C.: U.S. Census Bureau. Note: Data are for college graduates age 21–24 who do not have an advanced degree and are not enrolled in further schooling. Data for 2014 represent 12-month average from April 2013–March 2014. Shaded areas denote recessions. Recent college graduates have been less and less able to find jobs that provide health insurance. The share of young college graduates who have employer-sponsored health insurance coverage fell from 61 percent in 1989 to 31 percent by 2012. 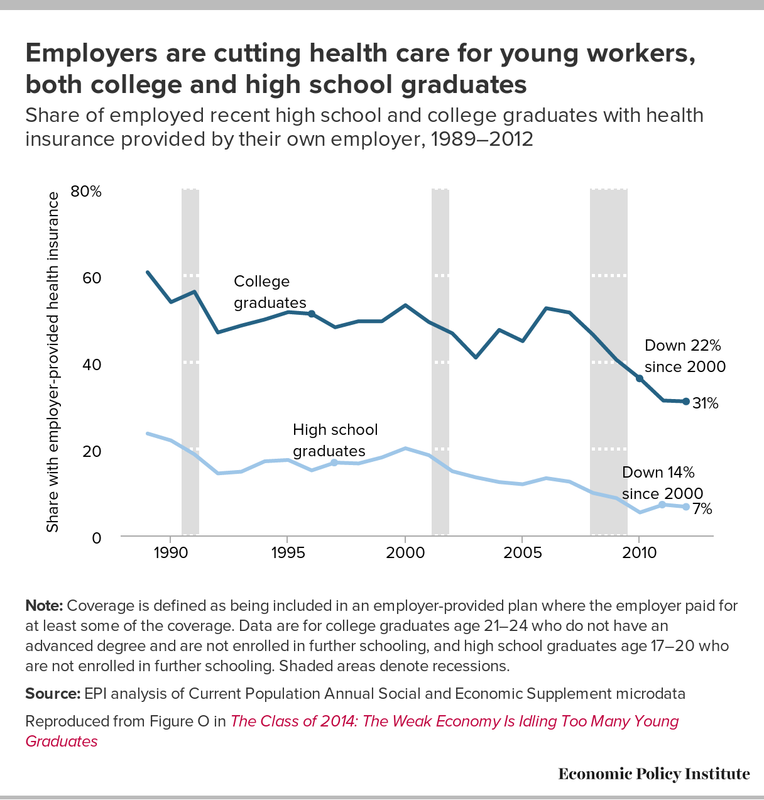 Most of this health-benefit erosion occurred since 2000, when just over half (53 percent) of recent college graduates had employer-provided health insurance. For high-school graduates, the decline was even steeper, from 24 percent in 1989 to just 7 percent in 2012. Source: EPI analysis of Current Population Survey Annual Social and Economic Supplement (CPS ASEC) microdata, Survey conducted by the Bureau of the Census for the Bureau of Labor Statistics [machine-readable microdata file]. Washington, D.C.: U.S. Census Bureau. In a nation of increasing inequality, the most extreme wage disparities are between the heads of large American corporations and typical workers. This figure tracks the ratio of pay of CEOs at the 350 largest public U.S. firms to the pay of typical workers in those firms’ industries. In 1965, these CEOs made 20 times what typical workers made. As of 2013, they make just under 300 times typical workers’ pay. This higher pay for CEOs does not reflect any increased contribution to corporate output: Other data show that CEO pay grew three times faster than the pay of the top 0.1 percent of wage earners and twice as fast as corporate profits. Moreover, the rising pay of executives was the largest factor in the doubling of the top 0.1 percent and top 1.0 percent share of overall household income growth. 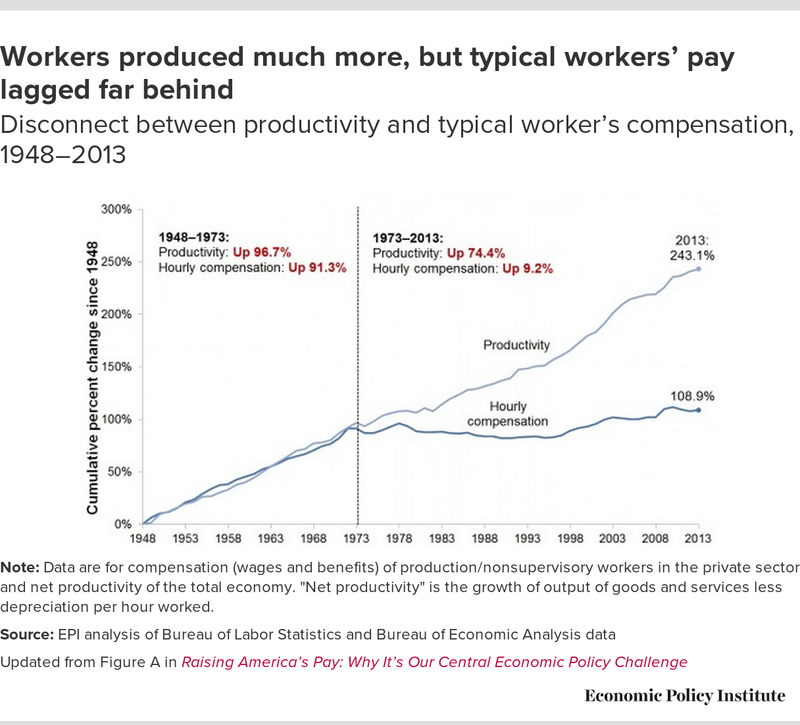 CEO pay gains help explain the growing divergence between pay and productivity. Note: CEO annual compensation is computed using the "options realized" compensation series for CEOs at the top 350 U.S. firms ranked by sales. Typical worker compensation is average compensation of production/nonsupervisory workers in the key industries of the firms included in the sample. The options-realized compensation series includes salary, bonus, restricted stock grants, options exercised, and long-term incentive payouts. Facebook's CEO is excluded from the samples in 2012 and 2013 (the only years for which the firm has been public) because his compensation is such an outlier (compensation of $2.3 billion in 2012 and $3.3 billion in 2013) that including it would have dramatically altered the results. 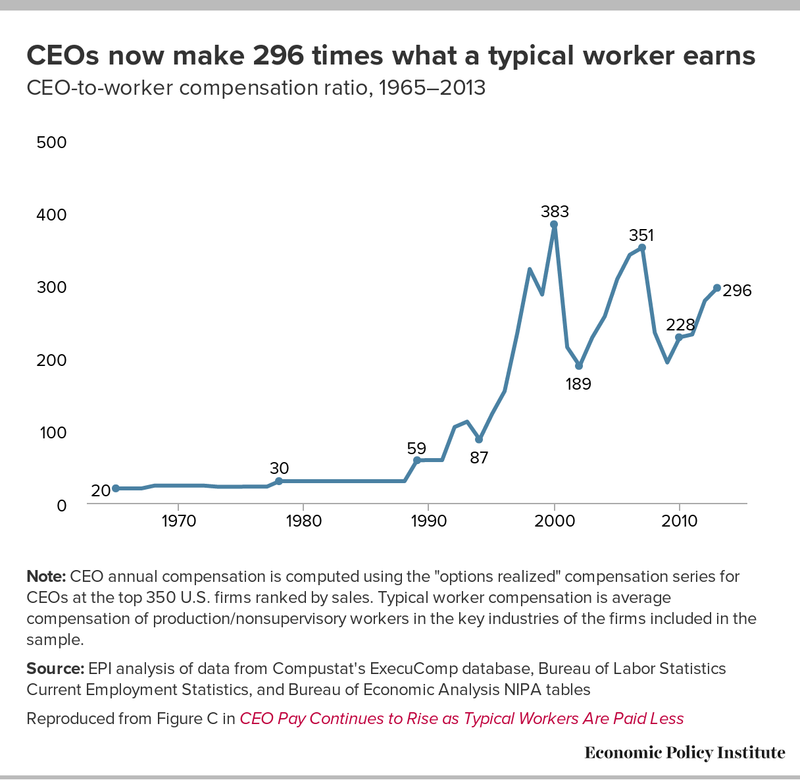 Reproduced from Figure C in CEO Pay Continues to Rise as Typical Workers Are Paid Less, by Lawrence Mishel and Alyssa Davis, Economic Policy Institute, 2014. While pay at the top of the labor market has outpaced nearly every labor market indicator for decades, pay at the bottom—the federal minimum wage—has severely lagged. This figure shows the decline in the real (inflation-adjusted) value of the minimum wage since its high in 1968 as well as what the federal minimum wage would be today if it had kept pace with the growth of real hourly wages of production and nonsupervisory workers (who make up 80 percent of the workforce) or economy-wide productivity. 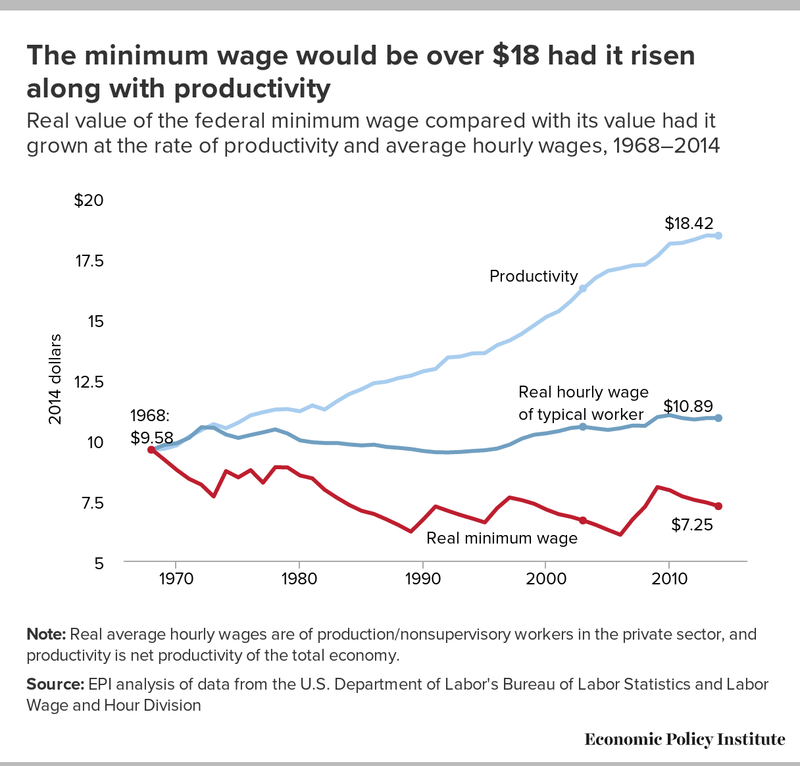 Had the federal minimum wage kept pace with productivity it would be over $18 today. Though not shown in the figure, the federal minimum wage did keep pace with productivity in the 30 years before 1968. The minimum wage essentially establishes the wage levels of the bottom fifth of wage earners. These low-wage workers are far more educated and are older than low-wage workers in 1968. Yet, despite being more skilled and productive, the wages they earn are lower than wages earned in 1968. The failure to raise the minimum wage had especially adverse effects on women and minority workers. Note: Real average hourly wages are of production/nonsupervisory workers in the private sector, and productivity is net productivity of the total economy. Note: Real average hourly wages are of production/nonsupervisory workers in the private sector, and productivity is net productivity of the total economy. 2014 values reflect average of the first half of 2014. Adapted from Raising the Federal Minimum Wage to $10.10 Would Save Safety Net Programs Billions and Help Ensure Businesses Are Doing Their Fair Share, by David Cooper, Economic Policy Institute, 2014. One of the main causes of stagnant wages and rising wage inequality is the decline of collective bargaining which has lowered the wages of both union and nonunion workers. 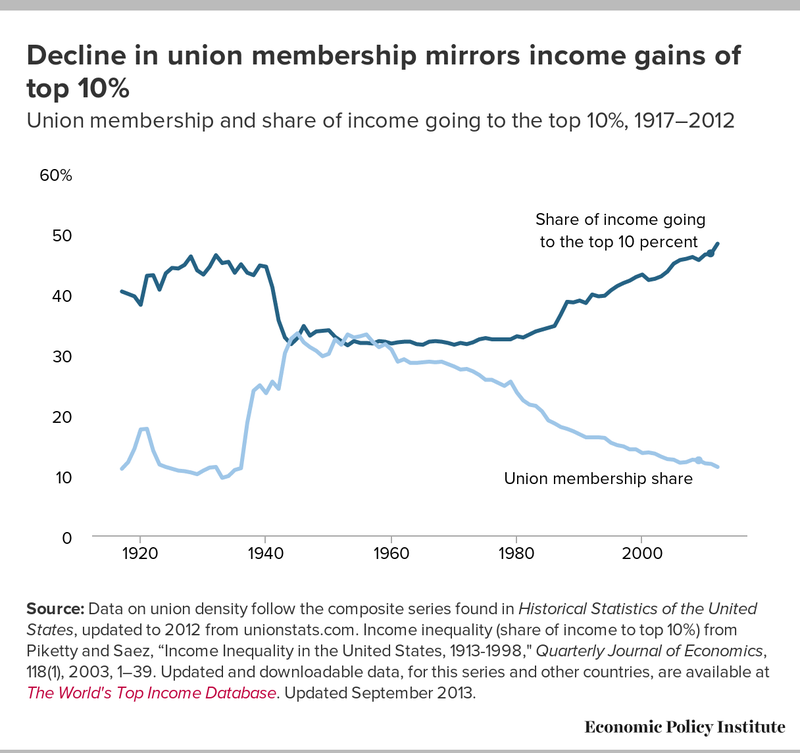 The figure shows that the drop in the share of workers under collective bargaining contracts is the mirror image of the rise of incomes of the top 10 percent. This occurs because collective bargaining not only raises wages for organized workers but also leads other employers to raise the wages and benefits of nonunion workers to come closer to union wage standards. This phenomenon occurs when collective bargaining achieves even modest penetration. The erosion of collective bargaining can explain from one-fourth to one-third of the growth of wage inequality between 1973 and 2007 and had a greater impact on men than women. This erosion of collective bargaining occurred despite large numbers of workers indicating they would prefer collective bargaining if they had a choice. But the political power of those with the most income, wealth, and power prevented the adoption of laws to modernize our labor–management system and enable workers to pursue collective bargaining. Source: Data on union density follow the composite series found in Historical Statistics of the United States, updated to 2012 from unionstats.com. 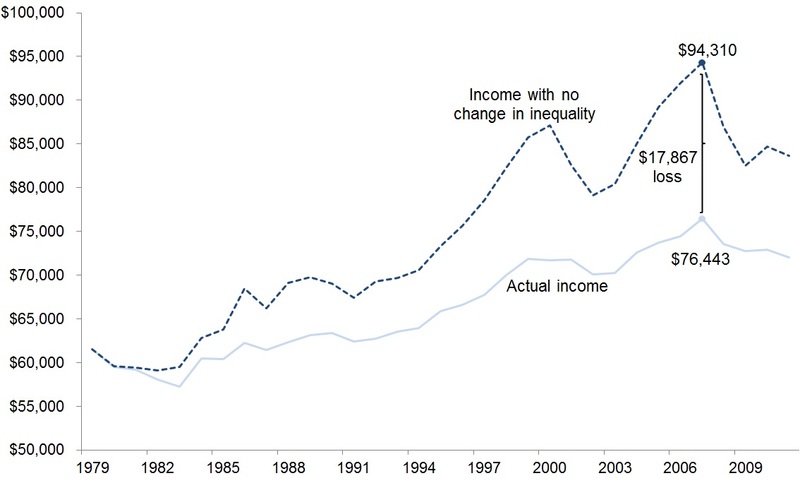 Income inequality (share of income to top 10%) from Piketty and Saez, “Income Inequality in the United States, 1913-1998," Quarterly Journal of Economics, 118(1), 2003, 1–39. Updated and downloadable data, for this series and other countries, are available at The World's Top Income Database. Updated September 2013. This paper provides a brief overview of some of the causes of wage stagnation and inequality. Sources in the references section provide a more complete analysis. Excessive unemployment, not only during and after the Great Recession but over most years since 1979, has suppressed wage growth, adversely affecting low-wage workers more than middle-wage workers but having little impact on high-wage workers. Global integration with low-wage countries, accelerated by particular trade policies (e.g., admission of China to the World Trade Organization in the late 1990s) has adversely affected wages of non–college educated workers. The erosion of labor standards (beyond the decline in the real value of the minimum wage) and weak enforcement have also put downward pressure on wages. Extensive wage theft, worker misclassification, weakened prevailing wage laws and overtime protections, and the failure to modernize our labor standards to provide sick leave, family leave, or minimum vacation schedules all hurt wage growth. The increased presence of undocumented workers who are vulnerable to employer exploitation also undercuts not only the wages of these workers but also those in similar fields. — The authors thank EPI research assistants Tanyell Cooke, Alyssa Davis, and Will Kimball for their valuable assistance in preparing the charts in this report. Lawrence Mishel, a nationally recognized economist, has been president of the Economic Policy Institute since 2002. Prior to that he was EPI’s first research director (starting in 1987) and later became vice president. He is the coauthor of all 12 editions of The State of Working America. He holds a Ph.D. in economics from the University of Wisconsin at Madison, and his articles have appeared in a variety of academic and non-academic journals. His areas of research are labor economics, wage and income distribution, industrial relations, productivity growth, and the economics of education. Elise Gould joined EPI as an economist in 2003 and is the institute’s director of health policy research. Her research areas include employer-sponsored health insurance, inequality and health, poverty, economic mobility, and the employer tax exclusion. She is a coauthor of The State of Working America, 12th Edition. In the past, she has authored a chapter on health in The State of Working America 2008/09; coauthored a book on health insurance coverage in retirement; published in venues such as The Chronicle of Higher Education, Challenge Magazine, and Tax Notes; and written for academic journals including Health Economics, Health Affairs, Journal of Aging and Social Policy, Risk Management & Insurance Review, Environmental Health Perspectives, and International Journal of Health Services. She holds a master’s in public affairs from the University of Texas at Austin and a Ph.D. in economics from the University of Wisconsin at Madison.